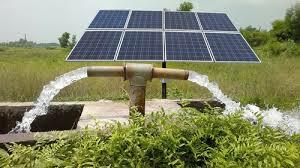 A solar pump uses power derived from sunlight that is converted into electrical power by Solar Photo Voltaic (SPV) modules. These modules give higher power output in the afternoons and lower power output in the mornings and evenings depending on the sun's position. 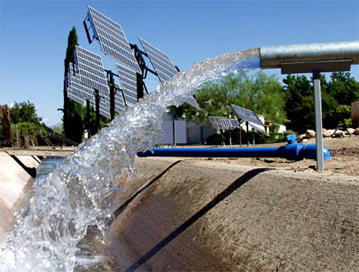 As a result, a solar pump works on varying power input and gives varying water output at a given pump head. Conversely, an electric or diesel powered pumpset works on constant power input giving a constant water output at a given head. Location - The location is important because solar energy varies from area to area, and sizing of solar panels depends on the solar energy in that area. - Capacity in the range of 200 Watt to 5 KWp. Interconnecting Cables and "On-Off" switch. Up to 2 HP : 120 V, 3-phase A.C, 50 Hz induction motors as standard, working with varying frequencies according to the sun's intensity. (customized pumps, with voltages other than 415 V and frequencies varying up to 60 Hz, can also be supplied against special customers requirements). PEW Solar pumps come with a triple mode maximum power point tracking (MPPT) feature. Under this, the pump, motor and solar modules are all made to run in the most optimum efficiency zone automatically. With variation in sun intensity, as motor tends to get underloaded, an electronic correction is applied to ensure maximisation of motor efficiency. Thus, efficiency of solar panels, pump and motor are maximised. This is facilitated by a Solar Pump Controller (designed as per IEC 61683) and tested by NABL/BIS accredited laboratory as specified by Ministry of New and Renewable Energy (MNRE), Govt. of India, under Jawaharlal Nehru National Solar Mission (JNNSM). Solar power is converted into varying DC power by solar PV modules, depending on changing sun intensities during the day. This DC power is converted into 3-phase AC power which drives the AC induction motor pump set directly. As a result, battery and battery charger are both eliminated. Dual Mode Unit - This option enables the user to run the same pump with either solar power or grid power, whichever is available. 1. Villages, schools, hospitals, homes etc.